Parakeets, also known as budgies, should eat veggies like romaine every day. Many species of parakeets exist, but the one most popular as a pet is the budgerigar parakeet, or “budgie.” According to LafeberVet.com, budgies eat mostly seeds. However, all-seed diets are deficient in protein, vitamins, and minerals. Vegetables, including romaine lettuce, round out the diet in both meals and treats. Vegetables, fruits and greens like romaine lettuce should be part of a parakeet's daily diet, and incorporating romaine into homemade treat recipes is a fun way to offer good nutrition. Romaine lettuce is available throughout the year, and is usually fairly inexpensive. According to the World's Healthiest Foods website, it is a good source of many vitamins, including A, C, K and B vitamins. It also contains several minerals, including potassium and magnesium, along with fiber. Camouflaging romaine with goodies is an effective way to incorporate it into a parakeet's diet, even for birds who aren't crazy about the stuff. Try mixing one leaf of shredded romaine lettuce with about a teaspoon of melted or softened peanut butter, and a teaspoon of seeds. Adjust amounts until you reach a consistency that allows you to shape small balls or patties. No need to limit yourself to peanut butter and seed; mix with any ingredients you know he likes. You can also cook larger batches of homemade parakeet treats, and thaw them as needed. 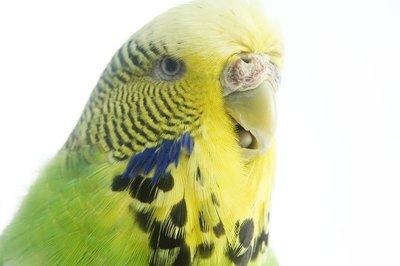 The Budgie Mania website lists numerous homemade parakeet treat recipes, some of which include vegetables. The sweet potato balls recipe, for example, calls for one sweet potato, 1/2 cup raisins, one mashed banana, 1 cup diced apples, 1 1/2 cups oatmeal, peanut butter and coconut as desired, and 1 cup of any fresh or frozen vegetable. Try using romaine lettuce as your vegetable. Form the mixture into small balls and freeze; thaw the treats out later before offering them to your bird. Hanging leaves of romaine lettuce through the cage bars offers visual stimulation, and reminds your parakeet of the natural leaf-picking behavior he would exhibit in the wild. This one-ingredient, easy treat consists of whole leaves of washed romaine lettuce, which you hang from the cage or poke through the bars. To further enhance stimulation, soak the leaves in water and hang the wet leaves through bars. Your bird will likely shake the leaves and take a "bath" in the falling water. Can You Leave a Parakeet Alone for More Than Eight Hours? Are Greenies Good for Cats?